With just two and a half weeks left in the 2016 General Assembly session, the chief players in the the state budget drama still haven’t begun talking — at a time negotiations normally would be in full swing. Gov. Dannel P. Malloy is frustrated with his fellow Democrats in the legislature’s majority — whose only plan for the new fiscal year was $340 million out of balance — and with a Republican minority that won’t issue a new plan. Majority Democrats didn’t appreciate things last week when Malloy proposed deep cuts to the chief initiative they are campaigning on this fall: a sales tax revenue-sharing plan with cities and towns. The GOP says both the governor and the legislature ridiculed their calls for labor reforms too many times over the past year. And since both now want to cut municipal aid primarily from wealthy districts — usually represented by Republicans — the GOP isn’t anxious to put its fingerprints on any budget in a state election year. Meanwhile, the red ink continues to pile up. Nonpartisan analysts say state finances, if not adjusted, are on pace to run $930 million in deficit in the fiscal year that starts July 1. And while legislators return to the Capitol in January, the new two-year budget they have to write already has built-in deficits topping $2 billion each year. At first glance, all sides in this drama have one thing in common, saying they want to adopt a budget that doesn’t increase taxes. Malloy and the Democratic majority took considerable heat last June when they adopted tax hikes worth $1.3 billion over two years and canceled more than $400 million in previously approved tax cuts — less than a year after Malloy successfully won re-election on a pledge not to increase taxes. 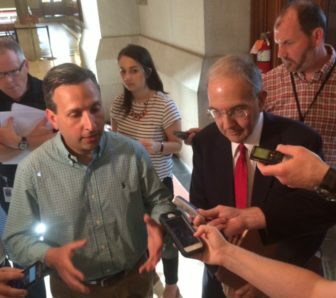 Senate Majority Leader Bob Duff, left, and Senate President Pro Tem Martin Looney. Several major corporations led by General Electric balked publicly at this reversal, and GE intensified the tax debate this past January when the company announced it would move its global headquarters from Fairfield to Boston. But dig a little deeper and the bipartisan stand on tax hikes comes somewhat apart. Senate President Pro Tem Martin M. Looney, D-New Haven, jabbed Malloy last week when the governor proposed cutting $91 million out of a Democratic legislative initiative to share $245 million in sales tax receipts with cities and towns in 2016-17. The governor’s budget effectively nullifies even more of that assistance because it also would reduce another major grant to municipalities, the Education Cost Sharing program, by $53 million. Looney argued this cut was tantamount to a tax increase, only it would occur at the municipal level in the form of higher property tax rates. Malloy also spared his own big initiative — a major new investment in transportation — as he cut the sales-tax-sharing plan, which also rankled Democrats. The governor’s challenge back to legislators is simple: If you don’t like my plan, submit an alternative, and make sure it is balanced. 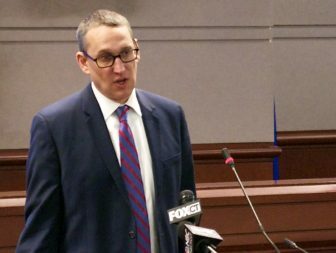 Malloy’s budget director, Benjamin Barnes, had been scheduled to meet with legislative leaders last Friday to begin budget talks. Looney’s statement was released late Thursday afternoon, and by Friday morning, the administration had informed legislators that Barnes was busy and unavailable for negotiations. So with the legislative session set to end on May 4, are their any circumstances under which budget talks could get under way? Malloy told The Mirror on Friday that there is one route: Use his budget as a template and go from there. If lawmakers want to start from a plan that is radically different, then they need to make sure it isn’t in the red. Republican legislative leaders insist the Democratic majority’s no-tax-hike pledge has a very short shelf life, and will be lifted next January when the larger deficit must be resolved. “This is a big-picture, long-term process,” House Minority Leader Themis Klarides, R-Derby, said. “When you look at that big picture, I think you see almost every fiscal policy the Democratic legislature and the Democratic administration makes just has the potential to accelerate the exodus” of business and wealth from Connecticut. 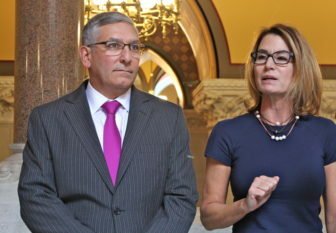 Klarides and Senate Minority Leader Len Fasano, R-North Haven, have said they don’t expect to follow their normal routine and submit a Republican budget option. The GOP leaders correctly point out that their chief budget-cutting proposals hinge on restructuring state employee salary and benefit costs, and that they called for them as early as April of last year, again during a December special session, and repeatedly since the 2016 session began in February. Throughout 2014, Malloy and Democratic legislative leaders called this a false solution, though they all reversed themselves this spring and supported concessions as the deficits grew worse. “Actions speak louder than words, and these issues should be looked at very closely,” Klarides said. 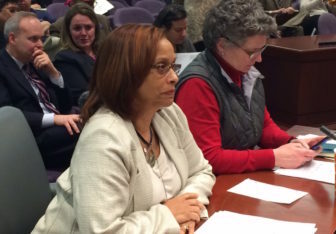 Still, union leaders continue to insist workers will not grant another round of concessions. And even if Connecticut could achieve concessions that matched the $660 million annually Malloy secured in the last deal — ratified in 2011 — Democrats note the GOP’s top proposal would cover only a third of the $2 billion deficit that must be solved in 2017. Privately, several Democratic legislators say state officials will be discussing tax increases in 2017, regardless of which party controls the General Assembly. But Republicans say the majority’s lack of respect goes beyond the concessions debate. Klarides questioned how GOP leaders can negotiate with Democrats when the majority and the administration have focused the overwhelming bulk of their town aid cuts on districts with Republican representatives and senators. But Walker rejected that argument, saying Connecticut’s cities have suffered for more than two years as programs they rely on have been cut repeatedly.